Interesting that Google (Wave, etc), Cisco and VMware all make my list, but not my own company (EMC). I also compared this year list to the last six months and found that more tech topics trended up – cloud (#3) and vmware (#7) and more general social media (FriendFeed and Facebook) dropped off the list. 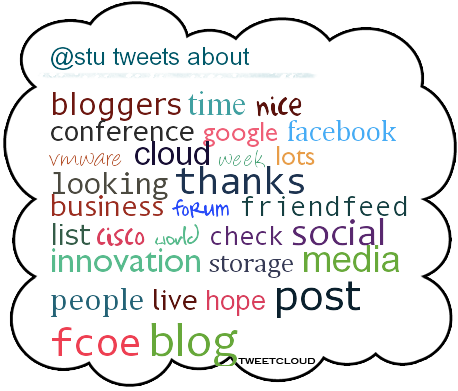 It’s good to see that for the most part, my Twitter Cloud does match my Twitter bio topics – social media, innovation, storage networking and virtualization. I was a bit surprised that “thanks” dropped off the six month list; so in case I haven’t said it enough, Thank You for everyone who has stopped by or had conversations on line. How do you determine what blogs to read? There are millions of choices and most people reach a point where they either become inundated with too much information or they stop adding new sources. Of course, if we continue to go to the same sources, we will be finding less new ideas. I read plenty of articles and there are a small percentage of blog posts that I read that I would like to be able to go back and read again or reference in blog posts. After reading articles from Louis Gray about Google Reader, I learned that not only can I keep a history of the articles that I enjoyed most, but I can also share the links with others. I find that one of the best ways to stay energized with blogging is to keep reading different viewpoints, and by looking at the shared links of friends, coworkers and bloggers, I could read the “expertly filtered” articles from many more sources than I would ever have time to read. I addition to sharing through the Google Reader interface, you can also use the bookmarket to share any item that you are reading around the web. There are other options for sharing such as social bookmarking and Twitter – and if you can, I recommend using multiple options – but only in Google Reader can you read the full articles and share them from a single screen. Whether you are an active blogger or reader of the web, it is a simple thing to share articles. It not only helps to promote the best articles that you find, but allows your contacts to spend less time in finding some great resources. You are currently browsing the Blog Stu - Stuart Miniman blog archives for November, 2009.